As you can see, we write this post from the same place as the day before. The border crossing didn’t work. We left the hotel early and arrived at the border at exactly 09:00. We were the first car to be let through, the Turkmen officers were friendly, and we knew we would have to get all our stuff out of the car. We unpacked, got 36 items through the X-ray scanner and then the car was thoroughly checked by the friendly young customs agents. Every corner of the car got controlled, I even had the chance to check it from below and saw some damage done by the potholes, but nothing critical. Our sat phone created some confusion, but no problem in the end. 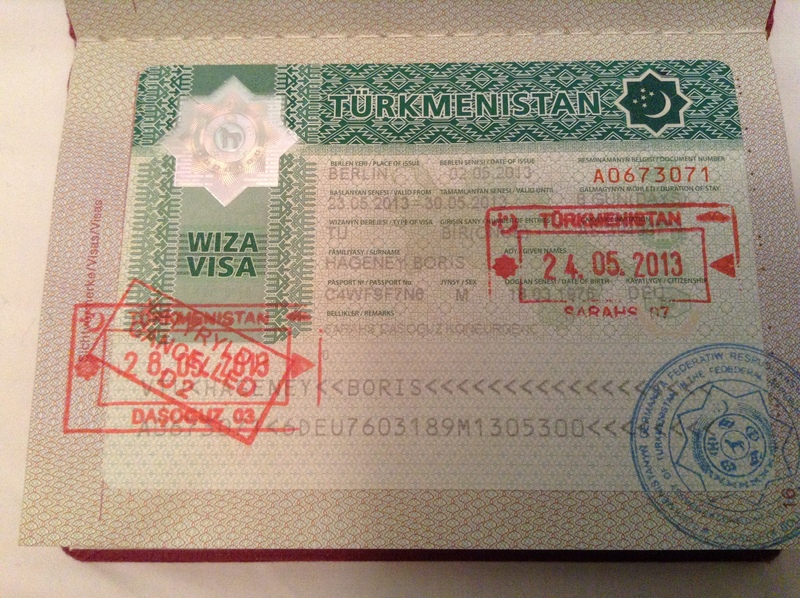 Then came the immigration control, and the officer in charge asked for our Uzbek visa, that we didn’t have. Since we had sent all visa documents for countries where we need a visa to our agency in Berlin and got them all back with the exception of the Azeri one, we were convinced to either not need one for Uzbekistan or would get it at the border. In the end we got everything done, packed the car neatly, with only the spare wheel on the roof, and drove through no man’s land into Uzbekistan. To be precise, until in front of Uzbekistan’s second border gate. We entered the barrack to get the formalities done and were asked for the Uzbek visa. We told the border personnel that we were supposed to get it at the border, all this with us speaking in English and them in Russian and Uzbek. After a while and some phone calls it became clear that we do need a visa, and that we would have to get it in Ashgabat. We had made the mistake to trust the Berlin agency to get all visas we need and not double check the regulations of every country we are crossing. We did not sign the russian language document the Uzbek border staff wanted us to sign, since we read “deportation” in Cyrillic on it and didn’t understand the rest. We turned around and drove back through the first Uzbek border gate, the soldier armed with an automatic rifle closed the gate behind us. We stood on a bridge over the border river, barbed wire on both sides, two closed gates watched by soldiers in front and behind us, at 36 degrees Celsius and no shade. The Turkmen soldier at first didn’t understand why we came back. We called the German embassy in Tashkent for help, but the responsible person was out for lunch. Somehow the Turkmen let us pass, until the border controls, and our guide was still there. We had to cancel the exit at immigration, re-do all entry procedures (see previous post from the Sarakhs border), did a quick version of the car check without the unpacking, and 74 USD lighter we left the border at around 16:30, back to the Uzboy hotel. We arranged for our passports to be taken to Ashgabat to get a visa, the Turkmen agency was very helpful. Then we had a late lunch with our guide Maia. Our forces left us at this point, and exhausted from this wasted day and the first organisational failure of our trip we fell asleep.